Say Anything extends the Say Hello, Good Bye project. A TextBox is used to enter text, so it can be said by the TextToSpeech component. Screen Arrangement and text input are introduced. 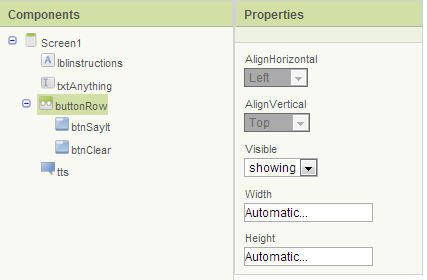 Add the components and make the appropriate adjustment of their properties. lblinstructions displays the phrase "Enter Text into the textbox and touch Say It" on the screen. 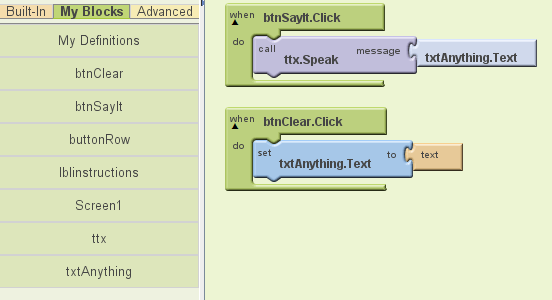 btnSayIt will call the method to convert the text in txtAnything to speech.